MONTREAL--(LadyDragon.com)-- 08/03/16--12.41pm EST, LadyDragon wrote - After reading this article, your life will never be the same. If you thought what Snowden said was shocking then be prepared for worst. It involves not only companies but all of your devices as well. The CIA found itself building not just its now infamous drone fleet, but a very different type of covert, globe-spanning force — its own substantial fleet of hackers. The agency's hacking division freed it from having to disclose its often controversial operations to the NSA (its primary bureaucratic rival) in order to draw on the NSA's hacking capacities. By the end of 2016, the CIA's hacking division, which formally falls under the agency's Center for Cyber Intelligence (CCI), had over 5000 registered users and had produced more than a thousand hacking systems, trojans, viruses, and other "weaponized" malware. Such is the scale of the CIA's undertaking that by 2016, its hackers had utilized more code than that used to run Facebook. In a statement to WikiLeaks the source details policy questions that they say urgently need to be debated in public, including whether the CIA's hacking capabilities exceed its mandated powers and the problem of public oversight of the agency. The source wishes to initiate a public debate about the security, creation, use, proliferation and democratic control of cyberweapons. Wikileaks has also decided to redact and anonymise some identifying information in "Year Zero" for in depth analysis. These redactions include ten of thousands of CIA targets and attack machines throughout Latin America, Europe and the United States. While we are aware of the imperfect results of any approach chosen, we remain committed to our publishing model and note that the quantity of published pages in "Vault 7" part one (“Year Zero”) already eclipses the total number of pages published over the first three years of the Edward Snowden NSA leaks. 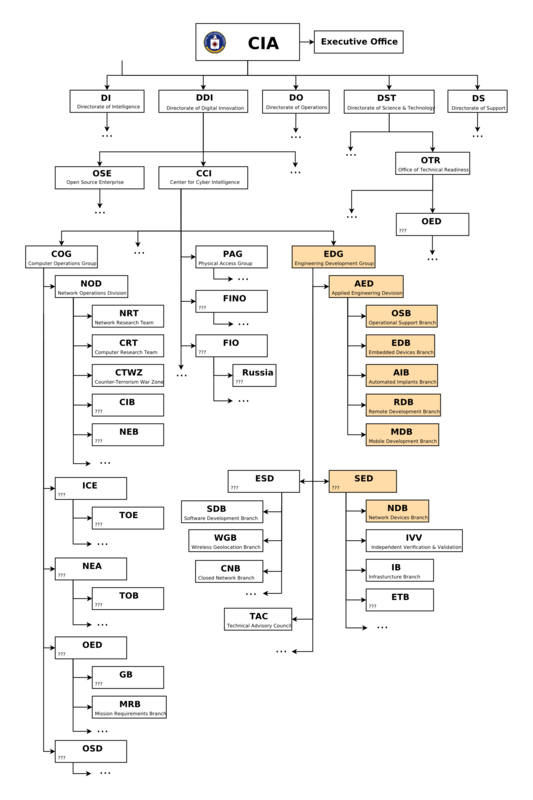 The DDI is one of the five major directorates of the CIA (see this organizational chart of the CIA for more details). The CIA's Mobile Devices Branch (MDB) developed numerous attacks to remotely hack and control popular smart phones. Infected phones can be instructed to send the CIA the user's geolocation, audio and text communications as well as covertly activate the phone's camera and microphone. Despite iPhone's minority share (14.5%) of the global smart phone market in 2016, a specialized unit in the CIA's Mobile Development Branch produces malware to infest, control and exfiltrate data from iPhones and other Apple products running iOS, such as iPads. A similar unit targets Google's Android which is used to run the majority of the world's smart phones (~85%) including Samsung, HTC and Sony. 1.15 billion Android powered phones were sold last year. "Year Zero" shows that as of 2016 the CIA had 24 "weaponized" Android "zero days" which it has developed itself and obtained from GCHQ, NSA and cyber arms contractors. CIA malware targets Windows, OSx, Linux, routers. software distributed on CD/DVDs, infectors for removable media such as USBs, systems to hide data in images or in covert disk areas ( "Brutal Kangaroo") and to keep its malware infestations going. Serious vulnerabilities not disclosed to the manufacturers places huge swathes of the population and critical infrastructure at risk to foreign intelligence or cyber criminals who independently discover or hear rumors of the vulnerability. If the CIA can discover such vulnerabilities so can others. The U.S. government's commitment to the Vulnerabilities Equities Process came after significant lobbying by US technology companies, who risk losing their share of the global market over real and perceived hidden vulnerabilities. The government stated that it would disclose all pervasive vulnerabilities discovered after 2010 on an ongoing basis. "Year Zero" documents show that the CIA breached the Obama administration's commitments. As an example, specific CIA malware revealed in "Year Zero" is able to penetrate, infest and control both the Android phone and iPhone software that runs or has run presidential Twitter accounts. The CIA attacks this software by using undisclosed security vulnerabilities ("zero days") possessed by the CIA but if the CIA can hack these phones then so can everyone else who has obtained or discovered the vulnerability. As long as the CIA keeps these vulnerabilities concealed from Apple and Google (who make the phones) they will not be fixed, and the phones will remain hackable. The same vulnerabilities exist for the population at large, including the U.S. Cabinet, Congress, top CEOs, system administrators, security officers and engineers. By hiding these security flaws from manufacturers like Apple and Google the CIA ensures that it can hack everyone &mdsh; at the expense of leaving everyone hackable. Securing such 'weapons' is particularly difficult since the same people who develop and use them have the skills to exfiltrate copies without leaving traces — sometimes by using the very same 'weapons' against the organizations that contain them. There are substantial price incentives for government hackers and consultants to obtain copies since there is a global "vulnerability market" that will pay hundreds of thousands to millions of dollars for copies of such 'weapons'. Similarly, contractors and companies who obtain such 'weapons' sometimes use them for their own purposes, obtaining advantage over their competitors in selling 'hacking' services. Most visibly, on February 8, 2017 a U.S. federal grand jury indicted Harold T. Martin III with 20 counts of mishandling classified information. The Department of Justice alleged that it seized some 50,000 gigabytes of information from Harold T. Martin III that he had obtained from classified programs at NSA and CIA, including the source code for numerous hacking tools. A number of the CIA's electronic attack methods are designed for physical proximity. These attack methods are able to penetrate high security networks that are disconnected from the internet, such as police record database. In these cases, a CIA officer, agent or allied intelligence officer acting under instructions, physically infiltrates the targeted workplace. The attacker is provided with a USB containing malware developed for the CIA for this purpose, which is inserted into the targeted computer. The attacker then infects and exfiltrates data to removable media. For example, the CIA attack system Fine Dining, provides 24 decoy applications for CIA spies to use. To witnesses, the spy appears to be running a program showing videos (e.g VLC), presenting slides (Prezi), playing a computer game (Breakout2, 2048) or even running a fake virus scanner (Kaspersky, McAfee, Sophos). But while the decoy application is on the screen, the underlaying system is automatically infected and ransacked. "Tradecraft DO's and DON'Ts" contains CIA rules on how its malware should be written to avoid fingerprints implicating the "CIA, US government, or its witting partner companies" in "forensic review". Similar secret standards cover the [url=https://wikileaks.org/ciav7p1/cms/files/NOD Cryptographic Requirements v1.1 TOP SECRET.pdf]use of encryption to hide CIA hacker and malware communication[/url] (pdf), describing targets & exfiltrated data (pdf) as well as executing payloads (pdf) and persisting (pdf) in the target's machines over time.